This book is an essential and practical tool for designing and creating fashion accessories for men and women. 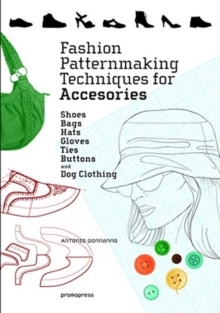 Intended for fashion students and professionals, the book includes different pattern techniques for each accessory and explains production processes so that readers can incorporate them into their professional practice, in addition to identifying and providing the information needed to recreate a wide range of accessory models. It includes descriptions of materials, examples of patterns and designs and different possible finishes through illustrations, photographs, technical drawings and texts that clearly explain the production process of each artisanal and industrial piece. As items that provide personality and originality to one's personal style, fashion accessories have become essential to completing the "look" for each occasion. With the help of this manual, having in-depth knowledge about the creation of different pieces, from a bag to a pair of shoes to hats, gloves, ties and buttons -even clothing for dogs-, is a great way to get started in this branch of the fashion field.